This entry was posted in Fanhood, Media and tagged Jeff Moorad, jerseys, Mike Dee, pcl, Tom Garfinkel, uniforms. Bookmark the permalink. 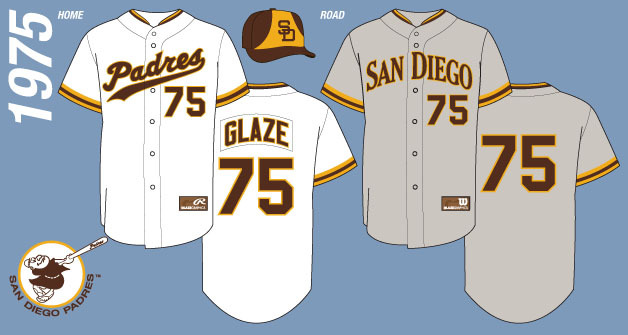 This post was originally published November 15th, 2011, shortly following the Padres announcement of their most recent jersey redesign. It’s reproduced here, unedited, made relevant after the discussion surrounding new Padres President/CEO Mike Dee’s proclamation that the team would not be incorporating the color brown into their look and ESPN/Paul Lukas ranking the Padres jerseys dead last for the second year in a row. Ray: Yesterday, after months of rumors and speculation, the Padres unveiled their new uniforms for the 2012 season and while no drastic changes were made, Jeff Moorad and Tom Garfinkel did give the uniform collectors out there something to put on their Christmas list. The biggest change is the piping featured on all of the jerseys, which is meant to emulate the design of the PCL-era set. Other changes include the evening out of the road script (goodbye bow tie) and a new alternate jersey which features the interlocking SD on the chest. The whole look is incredibly underwhelming, which seems to be what the Padres are going for under Moorad and Garfinkel, but before I go any further, what do you think, Mel? Mel: Let me start off by saying I want to avoid simply giving opinions of what looks good and bad. Everyone has their own tastes, so those types of discussions tend to not be very productive. Getting down to it, I disagree with this party line of “Padres fans are tired of seeing the jerseys changed all the time, so we only ‘tweaked’ them.” The new home jersey looks more like the 1999-2003 homes than the 2004-2011 homes, the road jerseys are the third set in as many years, the alternate has been completely replaced, and the piping is a very non-traditional Padre element. These are big changes as far as I’m concerned, and they don’t closely resemble anything I’ve seen a Padre team wear before. Moreover, the Padres have only worn the current navy blue and white color scheme for a year now after eliminating sand in 2011. Ray: I think the big problem with these jerseys, if I can jump to the point, is that they tried to sum up the history of the franchise with this new set and drew heavily from a completely different one. The Padres have been around for more than forty years and it still seems like all we’ve heard is about the PCL days. Has any other in team in baseball forgone decades of major league history to go with what their minor league predecessor did? And because they’re pulling from seventy years of completely diverse history, we have this bizarre mismatch that left us with a Swinging Friar that looks bad. How does that even happen? Mel: Most of what the team calls “taking inspiration from the PCL days” is a pretext. It’s an attempt to placate the fans who want a unique, San Diegan look, which of course means the color brown, and the brass hasn’t shown a willingness to go for that. So instead, they try to replace history the fans want with a history not many fans know about or care for. “See guys, we’re giving you history!” Except it isn’t. My father was 19 years old when the Padres last played in the PCL. It’s not something people identify with. It’s almost insulting what they’re doing. Then they threw in the Swinging Friar. That’s a nice gesture, but they need to do more. Ray: It seems like the team focus grouped this uniform to death, but I wonder who exactly they spoke to. They claim that they interviewed season ticket holders but I know a handful of those poor suckers and I don’t know a single one that they talked to. I can’t help but feel like the team knew what they wanted and set out in search of the answers they wanted to hear. I’m surprised they’re not now calling the team the Toyota Terrace Padres of San Diego. Mel: There were reports of focus groups two years ago. I agree, the team did what they wanted with the jerseys then found ways to justify it to the fans, rather than the other way around. Then the ownership threw in the 70s Friar as a “secondary logo” in an attempt to placate them. Getting back to the uniforms themselves, while I’d much prefer a modernized 1975 jersey, I would have been happy had they added something unique or distinctive to the look. They didn’t. While the 2011 version looked exactly like the Brewers, in 2012 the dominant blue color and piping simply mixes in a pinch of Mariners (see photo) then goes out to breakfast. The unique bit is the dark blue alt, which wins the small battle that no other team currently wears that exact jersey. 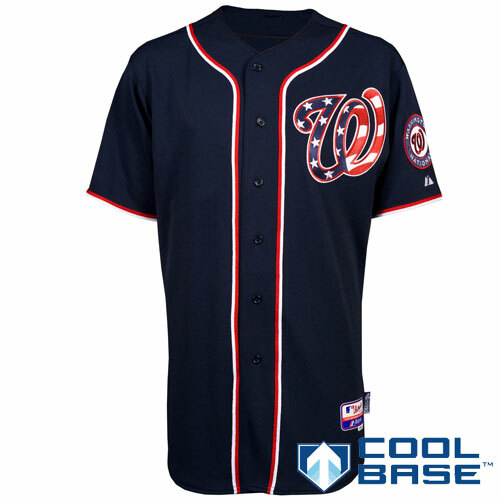 Although the Nationals have come close while the Tigers have worn that design with blue and white swapped as their primary jersey for 80 years. Ray: Besides the piping, which I’m not a fan of, there’s no cohesion between the three jerseys. They could very easily be from three different teams and that highlights what a half-assed job the Padres did. You mentioned the 70s Friar that they threw in to throw us a bone and it looks terrible. The monochrome look that the team has embraced gives everything a flat look and it’s so unnecessary. The 90s Friar looked like a cherub but at least some thought went into his design. 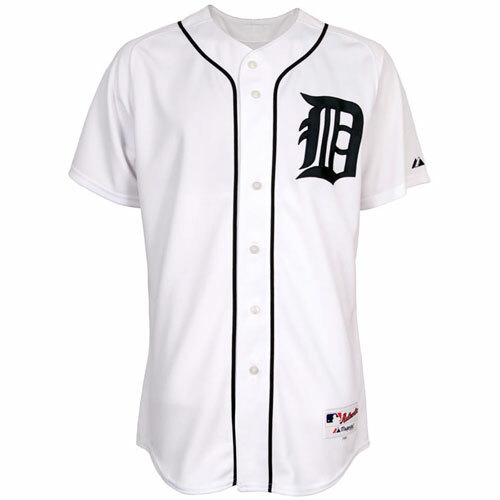 Mel: What changes would you suggest to make the three jerseys more cohesive? Ray: A concept. The team has the shampoo logo on the home jersey, what looks like the logo for nu-metal band on the road, and the SD on the alt. Look at what Moorad and Garf did in Arizona. That look isn’t perfect but it’s one look. Mel: I can’t see a way to put “San Diego” in the shampoo bottle font that would look good. In some ways I like the new San Diego wordmark, though it’s less unique, because it matches the SD on the primary logo and the alternate. If they’re not bringing back the brown, I’d prefer they stick with the current concept then change to something all new. Just give us something distinguishing along with it. Ray: Except it doesn’t really. If you look at the “S” in “San Diego,” you’ll notice that it’s angles are much sharper than the one on the hat and OH MY GOD RAY, STOP. That the cohesive aspects of this uniform can only be seen under intense scrutiny goes to show how poor this overall design is. I don’t hate the shampoo logo but my suggestion is to slap the SD on the home jerseys. That way, the aspects that are kind of similar run across all three. I’m actually surprised that the Padres didn’t do that, given how hard the new front office has pushed the SD logo. I enjoy that simplicity to a degree, but the Padres aren’t a traditional team and shouldn’t try to be. On the other hand, I am a fan of finding something that works, is distinctive, then sticking with it. Perhaps a simple design offers a better chance of finding a jersey that can withstand trends and pass the test of time. That said, “This change is the last change, we promise!” isn’t exactly believable. Ray: I don’t think the team shares your interest in finding something distinctive. It’s almost too appropriate that the Padres brought out these new uniforms in the same offseason that the Marlins completely overhauled their look and the Blue Jays took a serious nod to their relatively immediate history. Those two teams have declared their individuality (in their own ways) while the Padres have blended in. We both prefer some version of brown, aside from that happening, we have different ideas about the direction the team should go. Neither of us are in love with the redesign.